Yesterday was Garden Bloggers Foliage Day (GBFD) over at Christina’s which always highlights some interesting leaf, texture and color combinations that can carry the garden year-round. Busy with Thanksgiving and finding my own foliage pretty unremarkable this month, I did not prepare a GBFD entry this time, but today during a morning walk that included a visit to Coker Arboretum, I had a second chance to concentrate on autumn foliage. 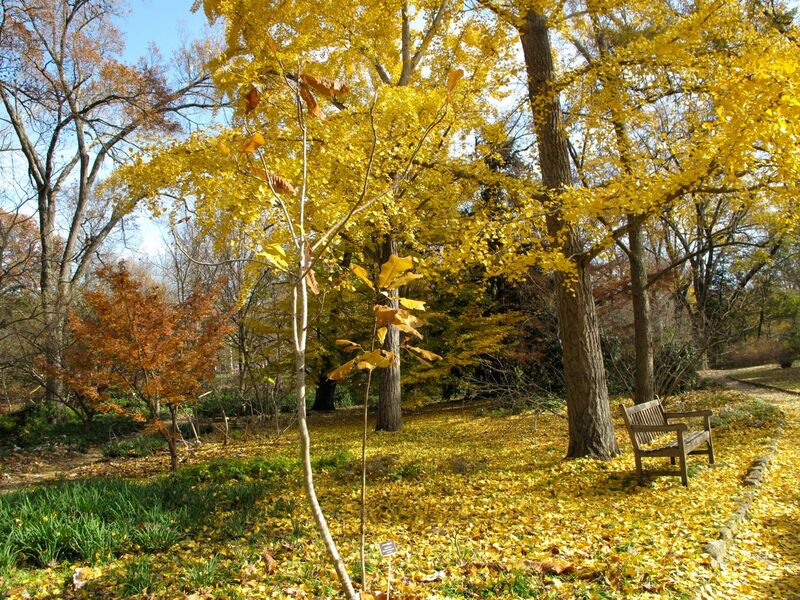 Just five and a half miles away, Coker Arboretum is a five-acre treasure on the campus of the University of North Carolina at Chapel Hill (my alma mater). It dates back to 1903 when UNC’s first Botany professor, Dr. William Coker, began creating an outdoor lab to study native trees and shrubs. 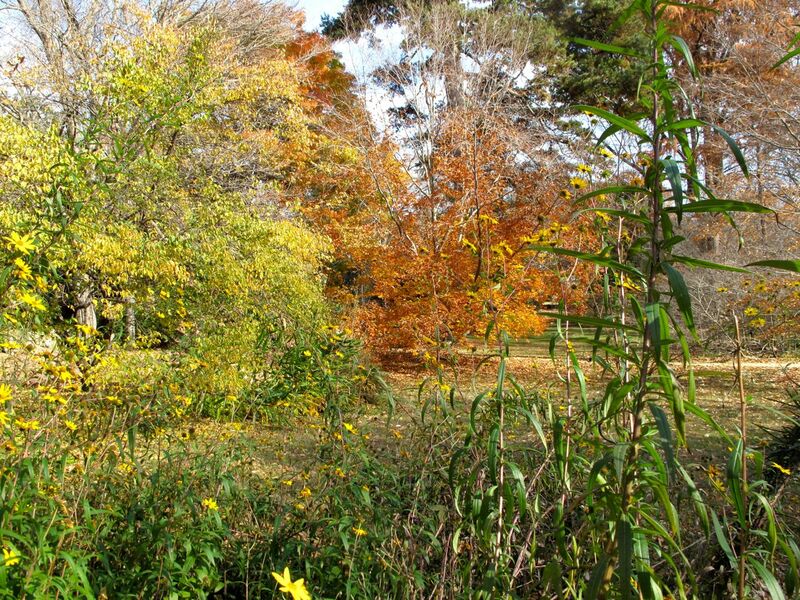 During the 1920s through the 1940s Dr. Coker extended the scope of the garden to include East Asian species, which correspond closely to many plants in North Carolina. In spring there are beautiful displays of daffodils, in early fall, red spider lilies. Today the majestic trees dominated the landscape, including numerous conifers and magnolias, American beech, Northern catalpa, American Elm, Japanese Maple, pond-cypress and bald-cypress. This morning a pair of Ginkgos were especially colorful. Fallen leaves from the Ginkgos covered the lawn, pathway and the bench too. When school is in session someone is nearly always sitting and reading on the teak benches that are scattered throughout the arboretum. The slender tree in front in the picture above is a western Florida native, Magnolia ashei (Ashe’s Magnolia).The USDA plants profile lists this deciduous magnolia as endangered. 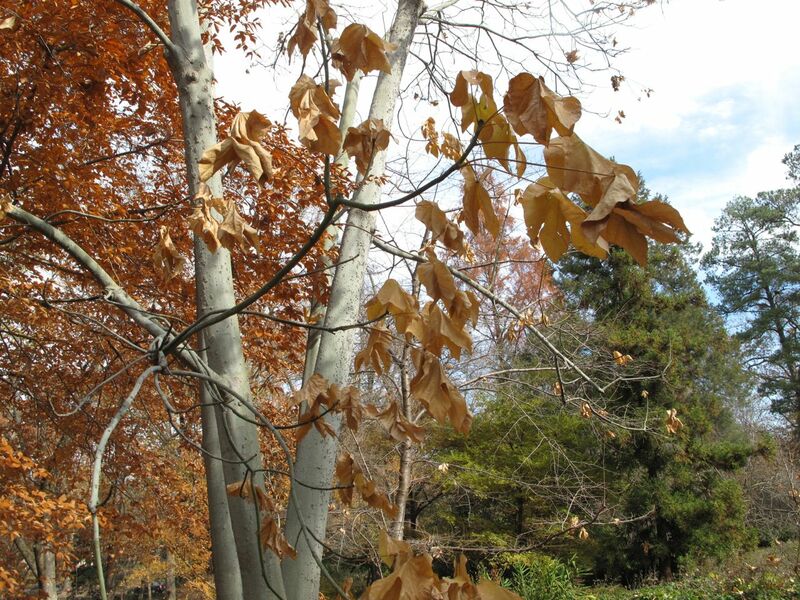 Firmiana simplex (Chinese Parasol-tree) is fascinating in any season, but today the white bark seemed very stark. Chinese Parasol leaves form dense shade in the summer. This tree is listed as invasive in some states, but not here as far as I could determine. 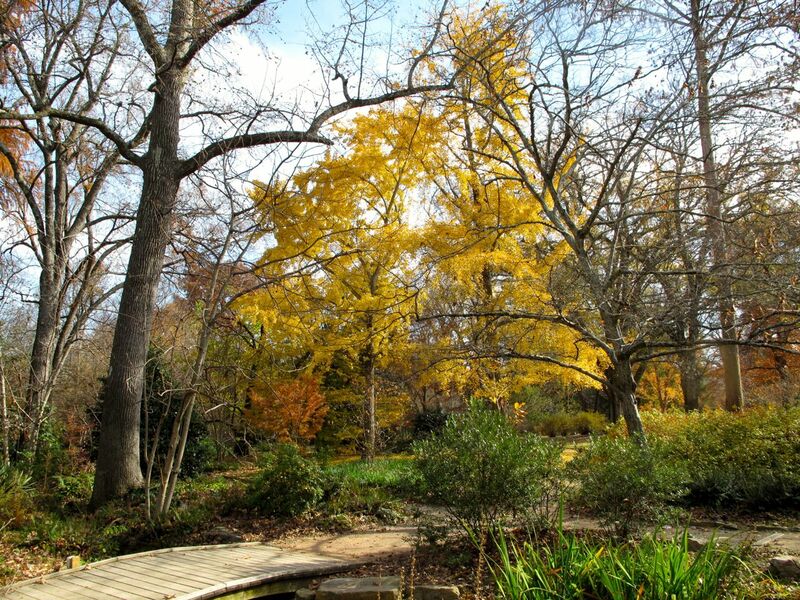 Coker Arboretum now is now under the management of the North Carolina Botanical Garden (NCBG), whose staff is well qualified to evaluate this and all the plantings here. 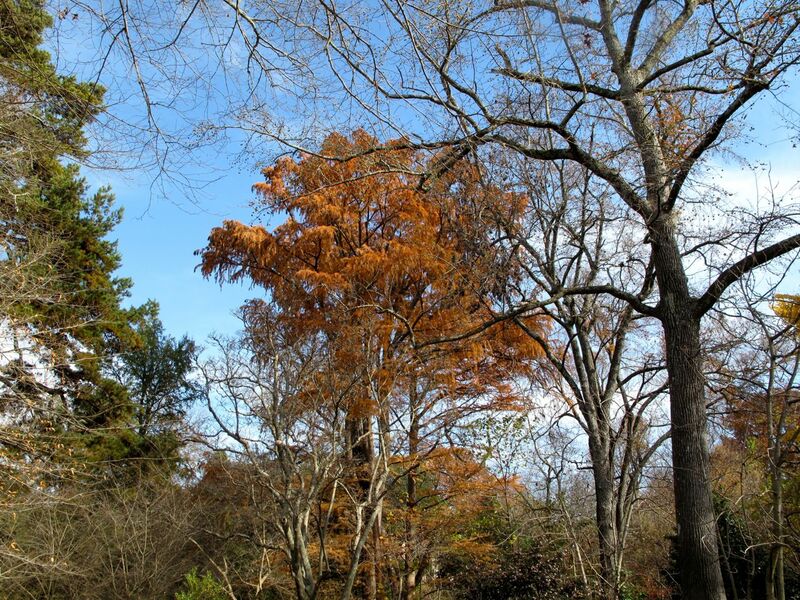 Coker Arboretum’s collection is extensive and there are many more interesting trees and shrubs to share. 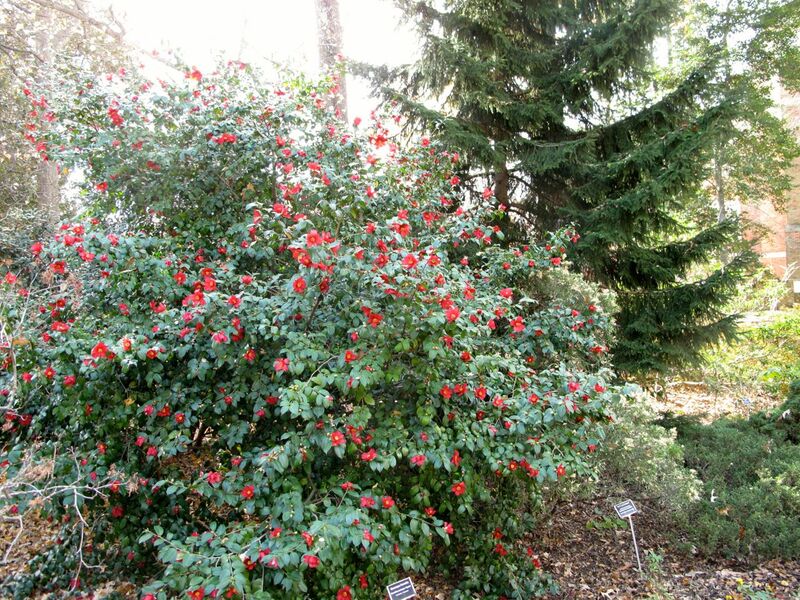 This final scene for today shows the bright red blossoms of Camellia sasanqua. 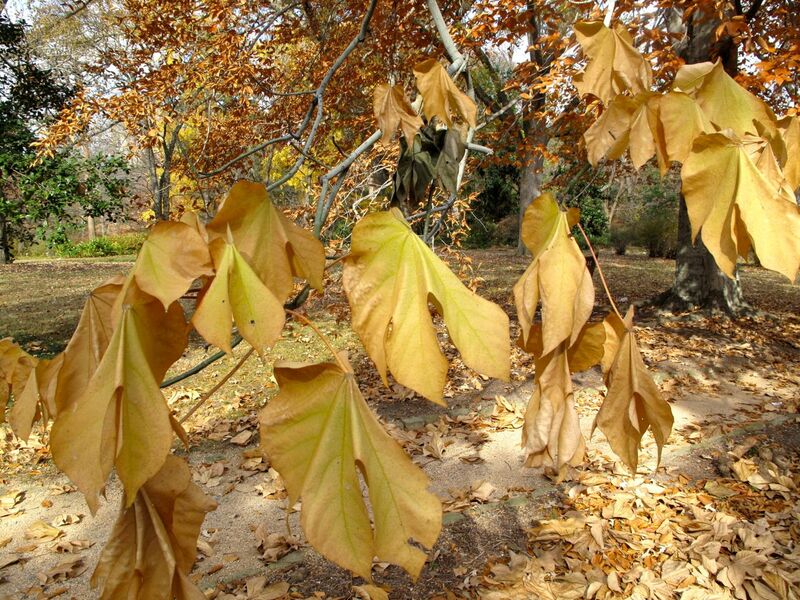 This entry was posted in garden and tagged Ashe's Magnolia, autumn color, Bald Cypress, Camellia sasanqua, Chinese Parasol-tree, Coker Arboretum, endangered species, favorite gardens, Garden Bloggers Foliage Day, GBFD, Ginkgo, invasives, nature photography, NCBG, photographing nature on November 23, 2012 by pbmgarden. This is lovely, even with many trees almost bare. The leaves on the ground are very attractive. I have never been to an aboretum. Are the trees labelled? I don’t know of any in Germany, but then we have so much forest. The camellia is very pretty, and that one is enormous! Yes, most of the trees are labelled. This came in handy some years back when my daughter made a leaf collection for school (and I still have her project)! A visit to an arboretum at this time of year is always exciting, so many lovely colours to photograph and different bark to see now that the leaves are falling. Your Dr. Coker sounds an enterprising man, its thanks to people like him planting trees many years ago that we have such wonderful places to visit now. Lucky you, studying in such surroundings! Yes, we do benefit from Dr. Coker’s vision. My family certainly has enjoyed the arboretum through many seasons. I love to walk there. 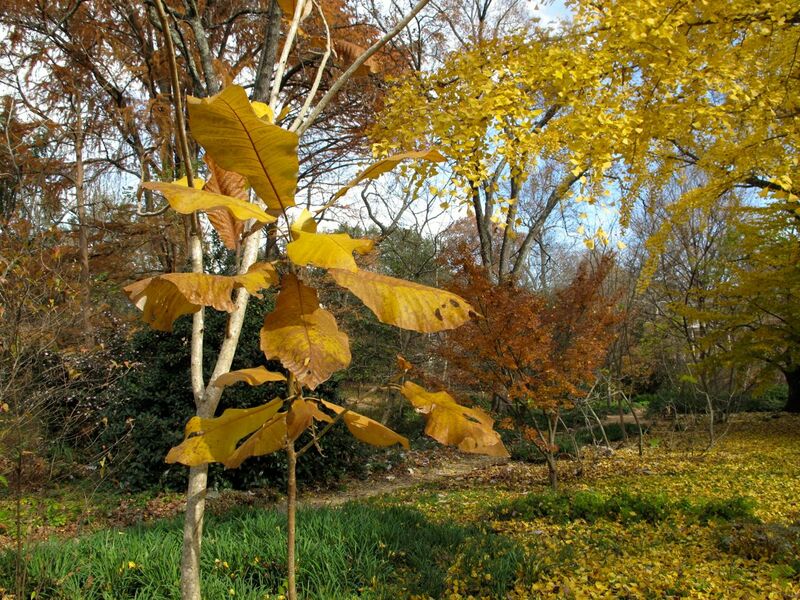 This arboretum also has shrubs and herbaceous plants now so perhaps the line that distinguishes it from a botanical garden is blurred, but both this and the botanical garden in town are affiliated with the University and emphasize research and education. Each is quite wonderful in its own way. A beautiful and informative offering in this blog. I love the simplicity with great educational value. Thank you. So kind of you Stepheny–thanks! I love discovering new trees such as the Firmiana in the post. I must find out more about it. It’s a fun one. Maybe you’ll come across one somewhere in your area. Let me know!